It was the best of textiles, it was the worst of textiles, it was the age of silk, it was the age of wool, it was the epoch of respectibility, it was the epoch of ornamentation… Well, you know. Here are two shawls given to me by family members. The first one, the plain black one, actually belonged to one of my ancestors – I believe my great-great grandmother, who came over from the Netherlands about 1883. She may not have brought this with her, but it perfectly represents what our family would value in a textile – serviceable quality without showiness. It is an extremely fine wool (or cashmere? ), woven so tightly it has a crisp finish like silk. 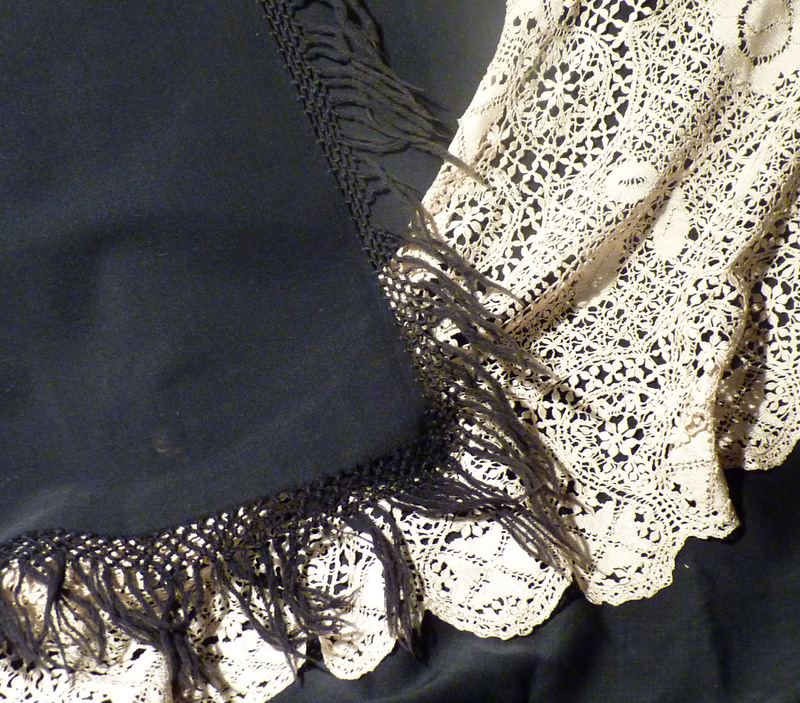 The black dye has held all these years without fading or destroying the fabric. The shawl as it measures now is about 60″ by 72″, with the simple tied fringe on three sides. It is not just missing the fringe on the fourth side – it is missing half the shawl! It used to be 60″ by about 145″. The story I always heard was that when the shawl’s owner died, two of her daughters couldn’t stop fighting over who should get the shawl, and so they just split it down the middle. When I got it (handed down through my grandmother and my mother), it had never even been hemmed on the split side, so whoever got it, got no joy of it. She couldn’t have ever worn it or put it out as a decoration, not with that one side unfinished. She must have stuffed it in a closet and left it. The second shawl (or fichu? scarf?) is the perfect opposite of the first. It is silk, handmade needle lace, very showy. It doesn’t seem like it could belong to the same family – and it didn’t! My grandmother bought it for me at a garage sale for 25 cents! 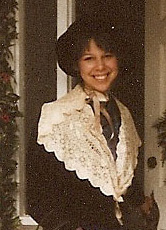 Wearing the lace shawl to a Dickens festival in my younger (but less historically accurate) days. This gives you an idea of the shawl’s size. I saw something like it in an old lace book one time, and that example was French, from the 1920s – but either I never copied the pages from the book or I have lost them. And though these shawls seem so different, they do have something in common – I should have documented better! I don’t know if my grandmother bought the garge sale silk shawl in Chicago or the Ozarks. I’m not even sure the black shawl belonged to my great-great grandmother – it could have been an aunt or a cousin twice removed. Since it ended up with me, it must be from the direct line of my ancestors – but if so, the story doesn’t ring true – I can’t see any of my relatives ruining a perfectly good object, no matter how bitter the quarrel. How sad to ruin the shawl that way. Are you going to hem it? Yes, I hemmed it years ago when I got it – but I don’t think I will ever use it for anything. The fringe is missing from a short side and it would be too awkward to wear that side up around my shoulders. It would look like a skimpy cape. Well, I guess if I ever need to dress as a Textile Super Hero, it could come in handy! 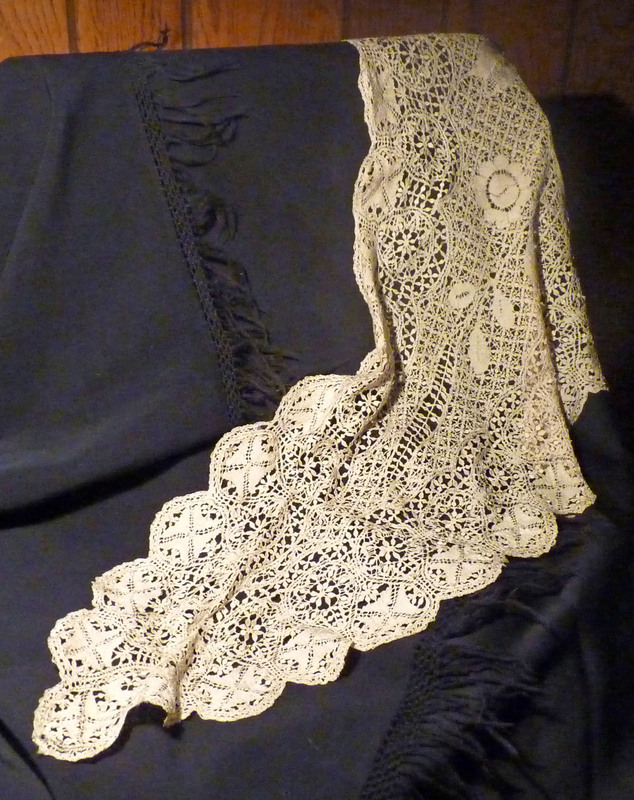 I thought about this lace piece when I was reading your post, “Name That Garment.” Is it a fichu? I don’t know! Glad you like it! More of your creations will show up soon!